ARMM (AUTONOMOUS REGION OF MUSLIM MINDANAO) Civil Service Exam- Paper and Pencil Test (CSE-PPT) given last October 26, 2014 finally has a result released by Civil Service Commission(CSC) on December 9, 2014, 32 working days after the test. 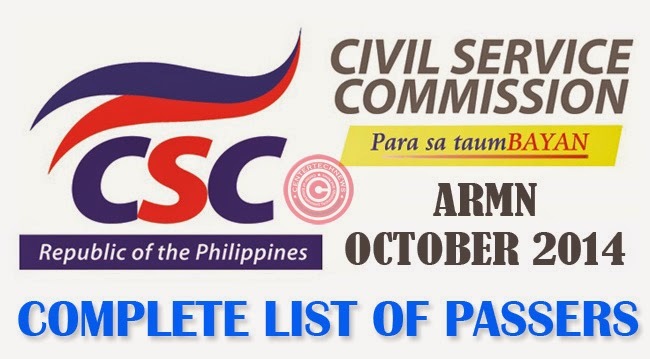 Both lists of Professional Level and Subprofessional Level had been released by CSC for ARMM Region. Those who passed must personally claim their Certificate of Eligibility while those who failed the test can get their Report of Rating through online. A passer must be able to pass a rating of 80 percent, however, this does not mean that you must correctly 80 percent of all the test questions as the rating is based on the top score. The CSE-PPT comprised of English and Filipino Vocabulary, grammar and correct usage, paragraph organization, reading comprehension,numerical reasoning and general information but the Professional Level must also take questions on analogy and logic while Subprofessional Level must take questions on clerical reasoning, functions and procedures.